» On Second, will radar slow drivers down? On Second, will radar slow drivers down? The radar sign would to go right about here, a block west of the Second Avenue railroad hump. Drivers on Albany’s Second Avenue will soon be seeing something new to catch their attention. 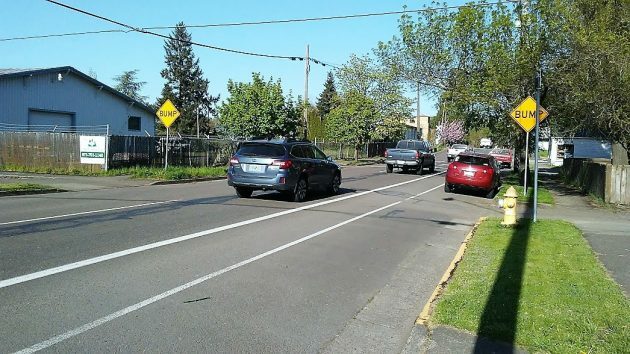 The city council Monday called for the installation of a radar speed display sign on Second at Thurston Street, a block before vehicles go over the hump of the railroad track. The speed limit there is 25 mph. Transportation Systems Analyst Ron Irish told me a Neighborhood Watch group had been complaining about speeding on the east-bound one-way street. The engineering staff told the council that the sign is too large and heavy — with solar panels, the radar setup and so forth — to be put on an existing or temporary pole. It would need to be on a pole 15 or 16 feet high and set in concrete. But the council liked the temporary idea and left it up to Public Works to figure out how to accomplish that. Councilor Rich Kellum said the idea is to test such a sign (the first in the city though two were set up by Benton County on Spring Hill Road in 2016) and see if it works in slowing traffic down. Signs of this kind display the speed of approaching vehicles, but they don’t take photos, and there’s no risk of a ticket. The railroad hump on Second, I thought, would have served as a natural speed bump. Maybe it does with mature drivers, but Irish told me that gouges on the pavement on other side suggest what some drivers have done: They went fast enough over the hump to get airborne. If that is the main problem, you might think that the radar sign could actually make things worse by egging drivers on to see how far they can make their rigs fly over the tracks. The sign would tell bystanders: Look how fast I can go! In the video below, I misspoke: The radar sign will be one block west, not east, of the railroad hump. Also in the video, the motorcyclist coming to a stop at the end is Mike Milligan, who with his partner runs Albany Shoe Repair just on the other side of the track on Second. Milligan told me that speeding really is a problem there. Whether the radar sign will have any effect will have to be seen. But to make this test worthwhile the city first will have to get data how how fast the traffic moves now. How many citations have been issued for speeding on 2nd in the last six months? I’d bet that no one can provide that info. Signs only are effective for a short period of time and unless enforcement accompanies the sign the placement is an expense that will, in the long run, produce no results. I use Second Street 2-3 times a week. I am so NOT impressed with how bumpy the right side is with the man-hole covers that are sunken below street level! A teeth jarring experience and a lot of them. Lots of drivers use the left side and can drive much faster as it is a much smoother drive, then switch to the right side before the tracks. I’ve never noticed cars driving at excessive speeds. You are spot on Hazel about the grade on some of these manhole covers around Albany streets! Numerous for sure but have you jarred over that BEAST at 2nd & Lyon (left lane)? Good grief & hello sink hole. Drive & bike safe friends. In the last place I lived, we used these types of signs near elementary schools to gently remind people of the speed limit and how fast they are going. If you are distracted when you come into the sign’s range, the lighting up of the speed sign will serve as a reminder to slow down. Those who are deliberately speeding will ignore it anyway – unless they think it is going to photograph them speeding in a school zone. A solution – go with crowd-sourcing methodology. Track passing cars for some period to see how fast people actually drive. Then, raise or lower speed limit depending on what measurements show. There is an optimal speed that balances safety with practicality. It seems abundantly clear that 25 mph is not that optimum. You have a point. While I tend not to rely on the average “Joe Citizen” to determine what is safe for a road, 25 mph can feel slow for this straight, two-lane, one-way stretch. That is until you get to the tracks and within sight of the stop sign and multiple lane changes begin. It is easy to creep up over 30 without noticing. My guess is that isn’t what is the pressing concern here. It has been a convenient shortcut for years to get over to Columbus, Waverly, or I-5. J. Jacobson has a screw loose. Allowing speed limits to be set using crowd-sourcing methodologies is no different than putting the fox in charge of the henhouse. In short order, our City Mothers and Fathers will bow to the crowd-sourcing gods, thereby absolving them of all legal, moral and ethical culpability. Soon thereafter, motorized traffic will be street legal cruising at 45, 50? Who knows how fast and loose things might get. The genteel Councilors must stand strong against the forces of freedom. Give the Great Unwashed an inch and they’ll take a mile. Albany has the best speed deterrents I’ve seen. Potholes and railroad crossings like on Queen St. They do way more to control speeds than any sign of police presence.